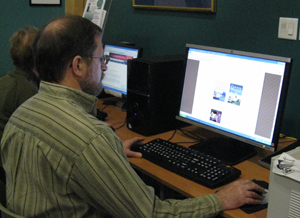 The library offers 8 Public Access Computers with High-Speed Internet Access and word processing software (etc.). The library also offers an Early Literacy Computer for children, which has access to educational games and BookFlix. The Library offers Wireless Internet Access 24/7 – inside & outside the building! The Library also has a Scanner for public use. Computer services are free, except for printing. Computer Training may be available by appointment. General assistance always on hand! Contact the library for a free tutorial – an introduction to the computer, internet use and/or the software available. Tutorials are very informal and usually one-to-one.